GyPSy Guide GPS driving tour from Calgary to Banff is a great introduction to the Canadian Rockies National Parks. Starting from the Airport or Downtown, 55+ audio points play automatically, featuring stories, tips and advice. All the benefits of a guided tour, the freedom to drive yourself. 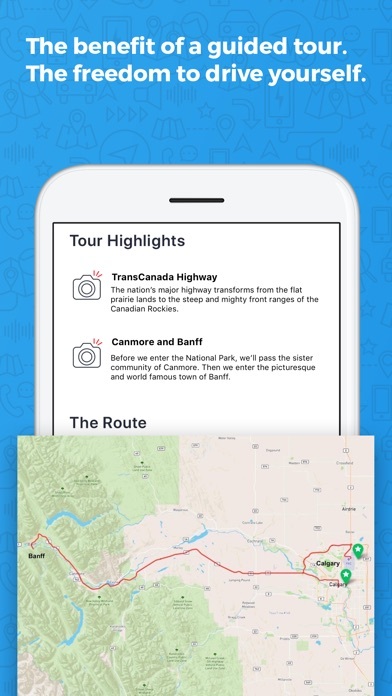 TOUR GUIDE AS YOU DRIVE TO THE ROCKIES If you like driving yourself when you go sightseeing, GyPSy Guide™ tour apps allow you to enjoy a guided tour experience while remaining totally independent. By driving yourself, you'll be able to get from place to place faster, see you things and not be tied to anyone else schedule DON'T MISS OUT ON THE BEST SIGHTS AND STORIES The tour apps use your device’s location abilities to play the commentary AUTOMATICALLY. All you have to do is drive, listen and decide which places you want to stop at. Our guides have created tours that provide a helpful and entertaining introduction to the Rockies. We’ll recommend the best places to see and some great locations that most visitors don't get to see. PLAYS AUTOMATICALLY GyPSy Guide knows where you are and which direction you are heading, and plays commentary automatically about the things you are seeing, plus stories and tips and advice. EXPLORE LIKE A LOCAL It’s just like having a local friend to show you around. And that friend just happens to be a professional tour guide. GREAT VALUE The same information you would get on a bus tour or from a guide book, for just a fraction of the price. And you control the itinerary and schedule. WORKS OFFLINE No data, cellular or even wireless network connection needed while touring. Download over Wi-Fi before you tour. Anyone can use them with no data charges – even visiting from another country. DRIVING TOUR ROUTE Begin right from Calgary Airport or From Downtown Calgary - The tour will give you directions for the fastest way to Highway 1 - We'll share stories, tips and advice to get you excited about your visit - Make informed decisions with your precious vacation time This tour is designed as an introduction as you arrive to the National Parks. It does not provide commentary from Banff to Calgary as you are leaving the Rockies. NOTES Download the app on Wi-Fi from your network at home or use any free Wi-Fi network. Because the app is filled with audio commentary and maps, its larger than "normal" apps. Many phone/data networks may block the download because of size - so its important to download over a Wi-Fi network. ++ Continued use of GPS running in the background increases battery usage - we strongly recommend taking a cigarette style (DC outlet) car charger. This is much better than simply plugging into the USB port in a vehicle. ** iPad users - please note that WiFi-only iPads will not activate the commentary automatically. Any iPhone or network-capable iPad (WiFi + Cellular - whether you have a network connection or not) will work just fine. ABOUT US GyPSy Guide™ produce award winning audio tours along scenic drives around the world. Enjoyed by travelers who prefer to set their own pace and itinerary on vacation, but enjoy a fun, informative and educational guided experience. Our goal is to provide a great introduction to the region and perhaps inspire you to learn more and return. None of our apps include paid advertising or placements for benefit. Good start to our trip to the Canadian rockies. Contained interesting comments and insight into the area. Glad we took advantage of the free download. Would recommend! This is the best App ever! Just returned from a trip to the Canadian Rockies and used all the touring apps for the Parks. They made the trip more interesting as well as letting us know what not to miss. Worked well on my iPad. The only complaint is the slowness when loading the apps. I was missing one of the tours and had to stop in a Visitors Center for their free WiFi. It took almost 45 minutes to access the site and download the app. I had similar problems when I did it at home too. Otherwise this is a great way to learn about the history and geology of the area. We were just about to leave to start a drive from Calgary to Vancouver, BC. I decided to see if there were any apps for the Banff area and found this app and 3 others along our route. I cannot say enough positive about GyPSy! The apps completely transformed our trip. The narator is like having a tour guide right in the car. He is easy to listen to with the right amount of humor. Talks included geology, wildlife, flora, history and much more. The app activates based on the car's location on the GPS so it doesn't matter how long you stop in places or if you take side trips, it's there when you return. NO DATA is used which was very important since we were from the states. 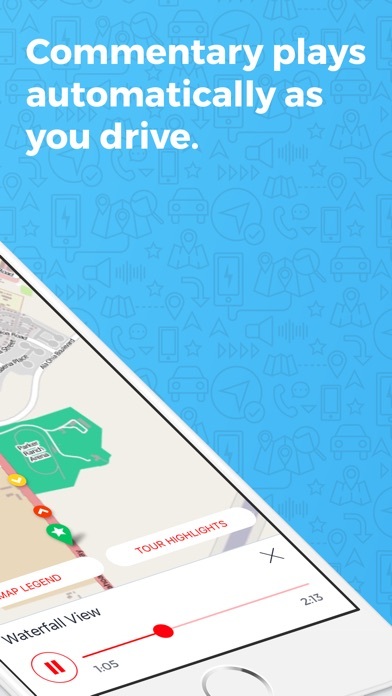 The app even gives suggestions on which exits to take for services, bathrooms, etc. 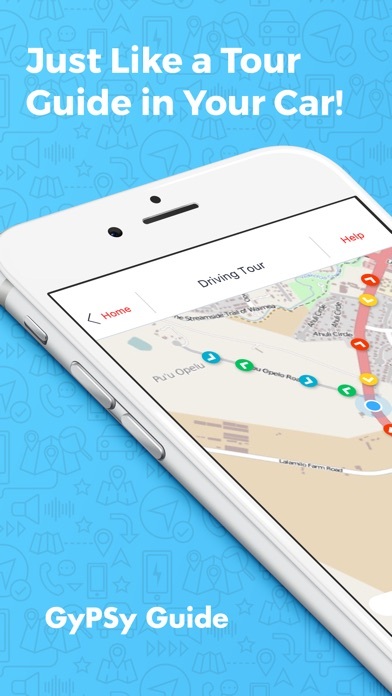 We learned so much along our drive that we would have completely missed without the app. 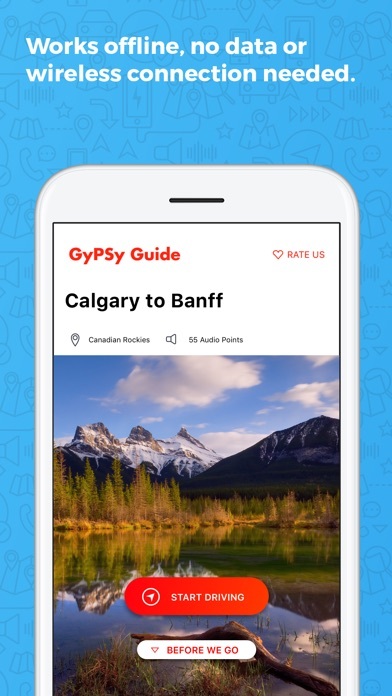 We can't wait for another road trip where we can use a GyPSy app! A great app!!! It made the trip go quick and gave great info. The app is amazing. I have bought several. Very informative and keeps us engaged. Wonderful idea - well done! 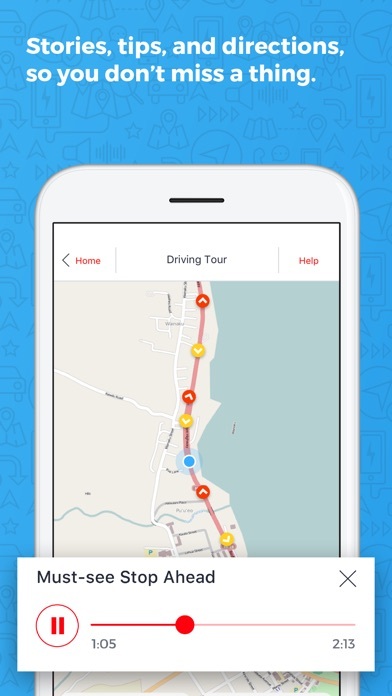 We love driving on vacations, so this app really is for the many of us who want to learn more about the areas we are driving through. And it's also nice to have a friendly voice in a strange place you are visiting for the first time. Delightful! I was VERY pleased with the Gypsy tours. I used 5 of the Canada tours and they are exceptional. They have made my travels so easy and enjoyable! I look forward to seeing more in the future. I would higher recommend them. This is a very well-done tour, with good GPS syncing, excellent narration, and just enough audio spots to keep you interested but not overwhelmed. Good facts on wildlife, ecosystems, landscape, history and industry. Absolute lacking any geology, though, and that is a big miss when touring mountains. If this were fixed, 5 stars for sure. I will be buying the tour from Banff to Lake Louise!